The U.S. economy has come a long way since the wreckage of the financial crisis, but some states have made more progress than others. Is your state one of the winners or is it one of the losers? Since 2011, CardRatings has ranked credit conditions in all 50 states plus the District of Columbia, based on a variety of factors. Below is a scorecard of how things stood as 2017 got under way - the best and worst states for credit, along with some of the states that have climbed or fallen the most in the rankings since this study began in 2011. 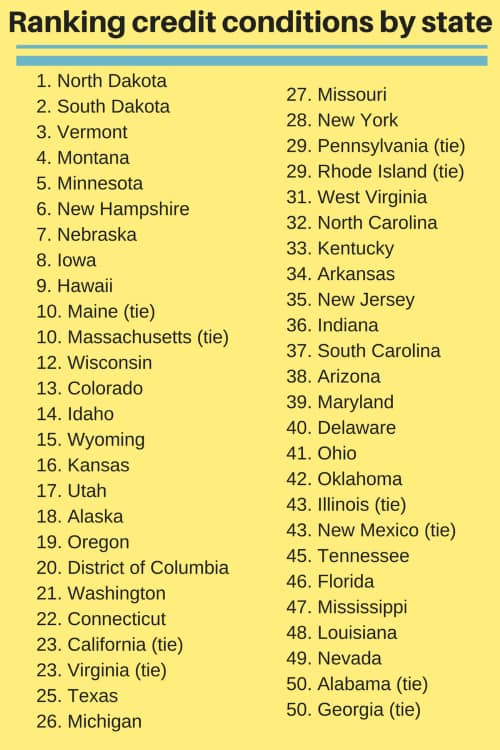 The overall best and worst states for credit conditions were based on the overall average of each state's rankings in the above five categories. While there are obviously a number of factors in each state that contribute to the reality revealed in each of the criteria above, given the political climate and preoccupation of late it is interesting to note that seven of the 11 states in the top 10 (there was one tie) voted Democrat in the 2016 presidential election while seven of the 11 states in the bottom 10 (again, there was one tie) voted Republican in that same election. 1. North Dakota. Placing among the three best states in all but one category, North Dakota was in the top 10 in all five. Among the favorable conditions contributing to its number one overall ranking was having the lowest foreclosure rate of any state. 2. South Dakota. A strong job market is the foundation for good credit conditions, and South Dakota is tied for having the lowest unemployment rate in the nation at just 2.7 percent. Besides that, South Dakota ranked among the 10 best states in every category. 3. Vermont. Despite not leading in any one category, Vermont ranks third overall on the strength of top-10 rankings across the board. 4. Montana. Montana ranked among the 10 best states in every category except employment, and barely missed the top 10 in that category with an unemployment rate of just 4 percent. 5. Minnesota. At 722.3, Minnesota's average credit rating is the highest in the nation. Minnesota was also above average in every other category, including having one of the lowest credit card delinquency rates - hence the high credit scores. 6. New Hampshire. What is it about cold-weather states that leads to strong credit conditions? Perhaps the low temperatures keep people well-motivated not to lose their homes. New Hampshire is tied with South Dakota for the lowest unemployment rate, and was better than average in every other category as well. 7. Nebraska. Ranking among the 10 best states in four out of five categories helped Nebraska overcome a bankruptcy rate that is around the middle of the pack. 8. Iowa. Iowa earned its way into the top 10 by being among the 10 best states in three out of five categories, and by being better than average in all five. 9. Hawaii. The clear outlier on this list in terms of climate, Hawaii earned its way into the top 10 primarily on the strength of very low unemployment and bankruptcy rates. One caution though - its foreclosure rate is a little higher than in most states. 10. (tie) Maine. Better than average in all five categories, Maine's greatest strength was its low bankruptcy rate. 10. (tie) Massachusetts. With the third lowest unemployment rate in the nation and strong rankings for average credit scores and low bankruptcy rate, Massachusetts earned its way into a tie for 10th best states for credit conditions despite a somewhat high foreclosure rate. >>> Take a look at a few of the biggest movers on the list. 1. (tie) Alabama. Two southern states share the burden of having the worst credit conditions in the nation. Alabama has the second-highest bankruptcy rate, and is also among the 10 worst states for credit scores, credit card delinquencies and unemployment. 1. (tie) Georgia. With a bankruptcy rate that is nearly as bad as Alabama's, Georgia also suffers from an average credit score and credit card delinquency rate that are among the five worst of any state. 3. Nevada. Continued struggles from the real estate crisis are evident in Nevada's foreclosure rate, which remains one of the 10 highest in the nation. Nevada is also among the 10 worst states for average credit scores and credit card delinquency rate. 4. Louisiana. Though its foreclosure rate is a little better than most states', Louisiana could not overcome an average credit score and a credit card delinquency rate that each rank second-worst in the nation. 5. Mississippi. Despite having a foreclosure rate which is actually among the 10 lowest in the nation, Mississippi made the bottom 10 by ranking among the 10 worst states in all the other categories, including having the lowest credit score and highest credit card delinquency rate. 6. Florida. Real estate remains a troublesome issue in Florida, where the foreclosure rate is fourth highest in the nation. 7. Tennessee. The biggest problem in Tennessee is the nation's highest bankruptcy rate. 8. (tie) Illinois. Despite being slightly better than most states in terms of average credit score and credit card delinquency rate, Illinois could not overcome ranking in the bottom 10 in the three other categories. 8. (tie) New Mexico. At 6.7 percent, New Mexico's unemployment rate is the second highest in the nation, which no doubt has created credit problems for many of its residents. 10. Oklahoma. The biggest negatives for Oklahoma are bottom-10 rankings in both average credit score and credit card delinquencies. Credit conditions are not static - they change over time, sometimes for the better and sometimes for the worse. 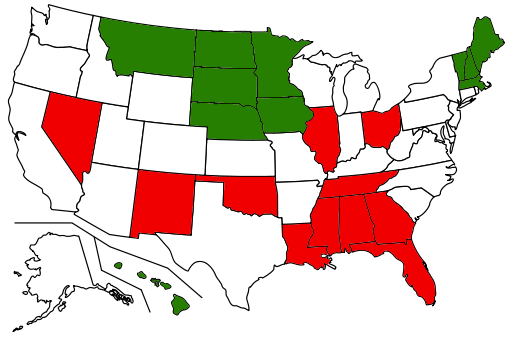 Here is a look at a few states moving in the right and wrong directions. Idaho. When this study was first conducted back in 2011, Idaho was one of the 10 worst states for credit conditions. Since then it has climbed 27 ranking places to reach number 14 overall. California. As a state that was hit hard by the real estate collapse, California ranked third from the bottom when this study was first done. Now, it has improved enough to just squeak into the top half of the rankings at number 23. Colorado. After ranking 38th in the first of these studies, Colorado has climbed to within sight of the top 10 at number 13. New Mexico. New Mexico has fallen by 21 places since the original study, from around the middle of the rankings to near the bottom. Notably, while job conditions nationally have improved considerably since 2011, New Mexico's unemployment rate has barely budged. Pennsylvania. Like New Mexico, Pennsylvania has fallen by 21 places since 2011. As a result, it has moved from being a top-10 state in the original study to the bottom half of the rankings, now at 29. Oklahoma. At number 25, Oklahoma was squarely in the middle of the pack in the original study, but by dropping 17 places since then it has now fallen into the bottom 10. Managing credit is largely a matter of individual responsibility, but surrounding conditions can have an influence. A weak job market can make it tough to pay the bills; a high foreclosure rate can depress all area real estate values. The above lists should help give you a feel for where surrounding conditions might have a positive or a negative influence on your credit standing. South Dakota is NOT riding North Dakota's oil boom. SD has been ranked in the top five states for two decades or more -- long before any significant drilling started in North Dakota. They've done this with sound fiscal policies, low taxes (no income tax) and moderate regulation -- and a fine education system that is perhaps the least costly in America.